Before we launch straight into today’s article, I think it’s only right that I preface it with a quick description of the garment we’ll be covering. With guy’s around the world becoming more and more interested in menswear and the ins and outs that accompany it, I feel it’s necessary to make sure we get the terms right. After all, dropping the lingo is half the fun, right? What I’m hoping to clear up is the distinction between the tailored jackets that are available to a man these days. Back in the 50s this would’ve been common knowledge but since then has sort of been lost – anything with sleeves and lapels these days is simply called a ‘blazer’. However, there are separations that need to be made. Traditionally, a blazer usually means anything with patch-pockets that comes in a monochromatic colour (i.e. navy, black or grey) with gold or silver buttons and no matching trousers. In contrast, a suit jacket always comes with matching trousers, is made from finer luxury materials, is smooth to the touch and has normal pockets. Then there is the one inbetween these: the sports jacket. Originally derived from the tweed-based, rustic coats that were used when out on hunts – and terribly British things like that – it has pockets with flaps, an additional ticket pocket and is of softer construction than a suit jacket. 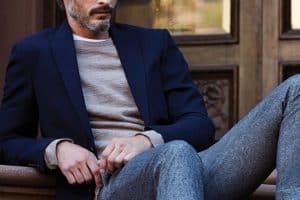 It also usually incorporates a pattern such as herringbone, stripes or checks, has no matching trousers and tends to be of a seasonal material such as tweed, flannel, seersucker or linen. But why did I just tell you all that? Sure, it’s always nice to know that I can drop a bit of knowledge when I have to, rather than just talking about my wandering meanderings all the time. And it’s definitely not because I’m writing a book on men’s style (or am I?) It was actually to help you distinguish a sports jacket from the crowd when purchasing it. Because purchase it, you should. We all know that unstructured blazers are going to be huge this season due to their relaxed nature and Neapolitan history. But what happens when you want to dress things up a bit without pulling out your suit or losing that relaxed vibe you were going for? That, dear reader, is precisely where the sports jacket comes in. For an example, let’s use the sports jacket that I own. It’s a cotton-linen blend (perfect for the summer months) in navy with a shadow plaid pattern. It was a gift from Banana Republic and I believe is on sale at the moment. The colour makes it versatile enough to be paired with everything in my wardrobe, whilst the subtle pattern helps distinguish it from other jackets around. When worn with a light blue shirt, burgundy chinos, black loafers and a navy striped tie it can hold its own perfectly in just about any formal situation outside of black tie. If I’m heading somewhere more casual afterwards, all I need to do is lose the tie and swap the shirt for a neutral polo. Even when worn with a white v-neck tee and some faded blue jeans, it still looks just right. Fit is King – as always, make sure it fits your properly! You want it hug your shoulders and follow the lines of your body all the way down to your waist. A good sports jacket should make you stand up straight and hold yourself differently. Most guys wear a size too big so always try the size down. You shouldn’t be able to throw a ball overarm in a properly fitting suit! What’s the plan? Think about what you’re buying this jacket for. Do you want it to serve multiple purposes at different events? Then stick to a neutral colour in a subtle stripe or check. If you have a particular event or setting in mind then there should be more room to get creative. Maybe something in pink or mint green in a bold stripe will do? Either way, planning is everything. Compliment, don’t match – You should think about what you will be wearing with the jacket as much as the jacket itself. Always try to compliment the jacket rather than wearing something in the same colour family. For example, if the jacket is in navy why not try burgundy or olive chinos? Or if you’re feeling really bold maybe something in yellow? If the jacket is in a less neutral colour such as red, stick to muted complimenting colours such as blues and greens. Regardless of your personal style or take on fashion, I think every guy can benefit from at least one sports jacket. For guys who prefer casual comfort, it’s an easy way to dress up a look without feeling too formal and stuffy in a suit. The same goes for the suit and tie men out there, it’s the perfect weekend addition that allows your look be more relaxed and playful without reaching straight for the unstructured blazer. Just remember the guidelines mentioned above, experiment with specific looks and try things out until you find what suits your style – and then wear the hell out of it!